New Diorama is connected to several vibrant communities, the most prominent being West Euston: a housing estate marked as a priority redevelopment area. We are also the local theatre for Regent’s Park and Fitzrovia residents, students at UCL and many secondary and primary schools. 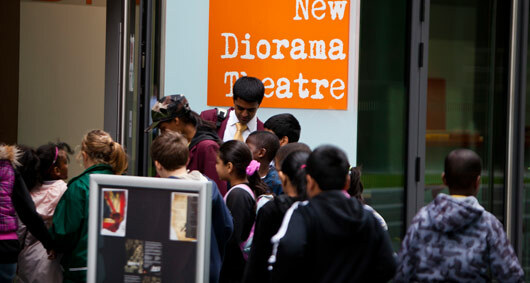 Built as a Section 106 space (with responsibility to serve our local residents), New Diorama, with our Principal Supporter British Land, Camden Council and West Euston Partnership, work to ensure that NDT is the cultural and creative heart of our community, going well above and beyond any statutory requirements. We ensure we are working with and for as many people across its community as is possible and open up our theatre space for local people to come and create their own projects and productions across the year, without any costs attached. Our community programme engages with over 10,000 local people every year and, in recognition of the success of our work in our community, New Diorama were named as Mayor of Camden's Charity 2012/13. The success of our community programme has also seen New Diorama nominated for several Arts and Business Awards with our Principal Supporter, British Land. Our partnership won us several coveted Business in the Community Big Tick Awards. Anyone living in West Euston is also eligible for £10 for all main shows across our season using a special discount code. To book these tickets and for more information call our box office on 0207 383 9034. Summer Performance Programme - Supported by Regent's Place, New Diorama worked with The Surma Centre and Bengali Workers association to run a month-long performance programme, covering theatre skills and technical workshops, culminating in public performances. A Huge Camden Fun Palace - New Diorama hosted an enormous Fun Palace, bringing eleven local community organisations together to run a whole day of events and activities for our local community. Attended by over 420 people, it included performances, arts and crafts, theraputic massage, storytelling, a huge catwalk and dance performances. Easter Primary Schools Storytelling - Over 200 local primary school children from Neltey and Christchurch schools attended easter storytelling workshops, and, thanks to Hampstead Road's Sainsbury's, were gifted a free easter egg. Primary Schools Performances - NDT programme performances for primary school children, which are totally free to attend. In 2018 140 children saw the huge Edinburgh hit, ME & MY BEE. Camden Youth Theatre - In partnership with Camden People's Theatre and Old Diorama Arts Centre, we run a free youth theatre for 13-19 year olds from Camden. In 2018, CYT will perform at Chrysalis Festival at the Traverse theatre, Edinburgh, having been selected as one of four companies from UK-wide and international entries to open the festival. Free Matinees for elderly residents - Alongside every main show in our season we stage a free-to-attend matinee for our local elderly residents. Partnering with The Third Age Project, we also provide refreshments and a meet-the-cast event after each show. Little Village HQ and Suited and Booted collections - New Diorama is the home for collections for these amazing charitites. Thought Fest Knowledge Quarter - Alongside Deafinitely Theatre, we hosted a series of panel discussions around mental health, specifically with regards to the Deaf community, as part of Regent's Place and The Knowledge Quarter's THOUGHT FEST 2018. "New Diorama Theatre is a fantastic resource for the entire local community. In addition to bringing award-winning productions to our doorstep, it offers extensive opportunities for local people of all ages and nationalities to explore their creativity and provides a creative hub around which the whole community can come together. I continue to be delighted and inspired by the outreach work the theatre team does." Heather Johnson, Our Local Camden Councillor, Chair of Development Control Committee and twice Mayor of Camden.